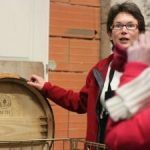 The wine adventure day is a full day of wine education and fun – a morning on growing and afternoon on wine-making* (option to do wine regions of France instead of winemaking in the afternoon) including eye opening education and experience with food and wine pairing. Then a day of activity walking or cycling (self-guide) to the next village for lunch (it is 5kms away so a perfect outing for a relaxed day walk). Experience the best that our locale has to offer. This includes all meals (with wine) except 1 dinner which is open for you to decide (eat in or book a michelin star restaurant nearby? let us know if you do want suggestions and to book a local restaurant and we can do it for you). STOP PRESS! Only one weekend left! Available Thurs to Sun or Fri to Mon 10-13 May, 11-14 May . (Mid week possible with slight change to itinerary.) Can be shortened to 2 nights (340 euro per person). Wondering how to get here? Book a direct flight to Bergerac from London City, London Stansted, Southampton, Edinburgh, Exeter, East Midlands, Birmingham, Bristol or Rotterdam. We are an easy 20 minute taxi from there. 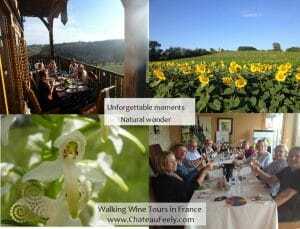 Come and stay or do a more indepth multi day course or multi day tour. 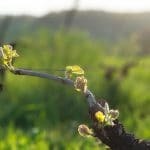 You can read about the story of this organic vineyard, wine school and farm – the series includes three books Grape Expectations; Saving our Skins and Glass Half Full by Caro Feely. You can also order a case of no sulfite added organic wine including shipping in the EU. 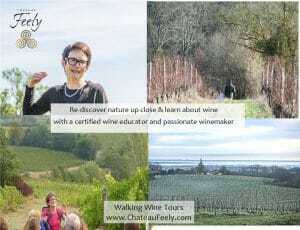 Join the mailing list to receive a seasonal newsletter, events, wine pairing, recipes and more info on this topic at the bottom right of this page.